Lately I've been working really hard to save some money by buying and freezing items when they are at their cheapest. I bought a ton of blueberries this summer when they were $1 a container and froze them for the winter time. By doing this, I can avoid paying ridiculously high prices for those items during off-season times. The only issue that I've run into is that I cannot for the life of me keep track of all the different bags of frozen items that are in my freezer. There are literally Ziploc baggies everywhere in my freezer. So. 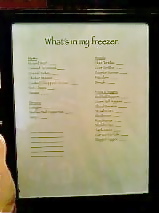 Today I decided to make a "whiteboard" of sorts for keeping track of freezer items. If you are looking for an inexpensive way to organize the items in your freezer, give this a try! You will simply need a picture frame. I did not have a spare one at home, so I purchased one from the Dollar Store (it was obviously $1). It is about an 8x10 inch size, but any size will work (a bigger frame will give you more writing space). The frame paint was awful, so I painted it with some black craft paint that I already had at home. Next you will need to print off a list of items that you regularly keep in your freezer. Here is the one I made for myself. Feel free to edit it, copy it, print it, or make your own! All you need to do is place your list inside the picture frame. The glass will act as a whiteboard surface, and any washable marker will work. Use the board to easily keep track of your freezer items. Simply use your marker to keep tally of what you've got! I recycled some old magnets by gluing them to the back of my frame so that I can attach my board to the fridge. Enjoy feeling a bit more organized for $1 or less!